Redmi Note 5, Note 5 Pro Make Their Global Debut In India! India is the first country in the world to get the Note 5 and the Note 5 Pro. Xiaomi's Mi TV 4 will probably cause an upheaval in the Smart TV market. The Redmi Note series made Xiaomi the biggest brand in India. The Note 4 was not only their best-selling device but also the biggest-selling smartphone in the country in 2017. The Chinese company has just launched the first products of 2018 and is hoping to repeat the story, this time bigger and better. 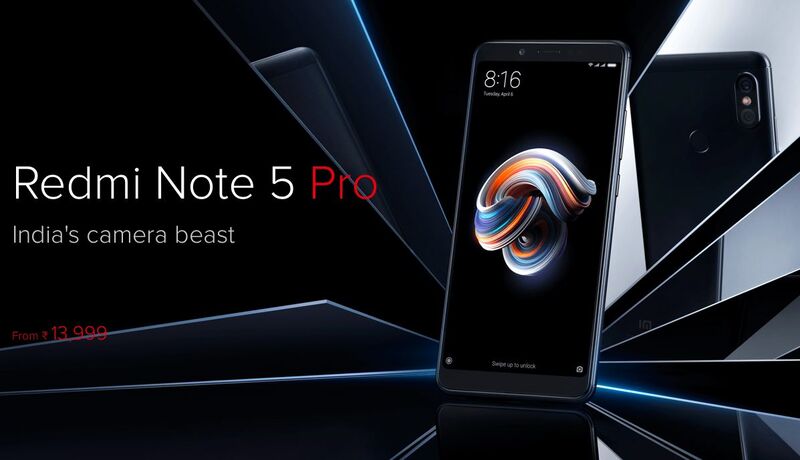 Xiaomi has just launched Redmi Note 5 and Redmi Note 5 Pro in the country. They come with incremental, yet critical, upgrades to keep updated with the latest trends. But their best part is the pricing! Xiaomi seems to have understood the Indian market and has priced the Redmi Note 5 similar to the Redmi Note 4’s current price. This is incredible value for a smartphone that has a bigger display, improved cameras and a new 18:9 form factor. Both the Note 5 and Note 5 Pro will come wrapped in a metal body like the Redmi Note 4. One of the major changes is going to be the 5.99-inch Full HD+ 18:9 ratio widescreen display running at a resolution of 2160×1080 pixels. Both the new Notes will be available in two storage variants. Alongside the Note 5 series smartphones, Xiaomi also launched its first television in India, the Xiaomi Mi TV 4. It claims to be the thinnest LED TV in the world with a thickness of just 4.9 mm. The Note 5 is the lower-specced variant of the two new smartphones launched today. It is closer to its predecessor, the Redmi Note 4, in terms of size. The Redmi Note 5 will feature a similar body like the Note 4. A metal body and a sturdy finish will grace the exterior. The fingerprint scanner can be found in its usual place at the back, below the camera. The Note 5 will sport a 5.99-inch Full HD+ display with a screen resolution of 2160×1080 pixels and a widescreen 18:9 aspect ratio. The smartphone has minimal bezels at the top and the bottom. The smartphone will be powered by the same Qualcomm Snapdragon 625 chipset coupled with Adreno 506 GPU coupled with 3GB or 4GB of RAM. The smartphone will be available in two storage options of 32GB and 64GB. The Note 5 has a hybrid SIM slot and supports memory cards up to 128GB. The device will run Xiaomi’s own MIUI 9.2 out of the box, based on Android 7.1.1 Nougat. However, the smartphone will get updated to the latest Android 8.0 Oreo in the coming few months. The Redmi Note 5 will come with a 12-megapixel shooter at the back with an aperture of f/2.2, 1.25um pixel size and a dual-tone LED flash. Up front, it has a 5-megapixel shooter coupled with an LED flash. The connectivity options on the smartphone include Bluetooth, dual-SIM cards (hybrid sim slot) WiFi and GPS. The device supports all 4G LTE bands with 4G VoLTE. The whole package will be kept ticking by the same mammoth 4,000mAh battery as the Note 4. It doesn’t support fast-charging though. 3GB RAM + 32GB Storage. Priced at Rs. 9,999/-. The Note 5 will come in four color options; Black, Gold, Rose Gold and Lake Blue. The Note 5 will be available exclusively on Flipkart and mi.com starting February 22. Offline sales will follow soon after. Reliance Jio is offering Rs. 2,200 instant cashback and 100 percent extra data with the Redmi Note 5 as a part of launch offer. The Redmi Note 5 Pro is the bigger brother of the Note 5. It is also the global debut of the Snapdragon 636, which has been launched first in India. As its name suggests, the Pro model offers more features and better specifications than the Redmi Note 5. The Redmi Note 5 Pro has a metal body and a sturdy build with specially reinforced corners to withstand impacts. The fingerprint scanner is at the usual place at the back, easily reachable for quick unlocking. The Note 5 Pro will sport a 5.99-inch Full HD+ display with a screen resolution of 2160×1080 pixels and an 18:9 aspect ratio. The minimal bezels on the top and bottom allow for a bigger display in a relatively smaller body. The Note 5 Pro will be powered by the new Qualcomm Snapdragon 636 processor coupled with Adreno 509 GPU and paired with 4GB or 6GB of RAM. There will be only one storage variant of the Note 5 Pro. It has a hybrid SIM slot which can take memory cards up to 128GB. The Redmi Note 5 Pro will run MIUI 9.2 out of the box, based on Android 7.1.1 Nougat. It will receive the Android 8.0 Oreo update shortly. The Note 5 Pro has puts more emphasis on the camera. There’s a dual-camera setup at the back featuring a 12MP primary sensor and 5MP secondary sensor with a dual-LED flash. Up front, the selfie camera sports a higher resolution at 20 MP and it is coupled with an LED flash for better low-light performance. The Note 5 Pro is also the first Xiaomi phone to get the Face Unlock feature. The Note 5 Pro supports Bluetooth 5, dual SIM cards (hybrid sim slot) WiFi and GPS. The device has an improved LTE modem, and supports all Indian 4G LTE bands with VoLTE support. Note 5 Pro will be powered by a mammoth 4,000mAh battery and will support fast charging through QuickCharge 2.0. Prices of the Redmi Note 5 Pro in India start at Rs. 13,999/- for the 4GB RAM + 64GB Storage variant and Rs. 16,999/- for the 6GB RAM + 64GB Storage variant. The Note 5 Pro will come in four color options; Black, Gold, Rose Gold and Lake Blue. Note 5 will be available exclusively on Flipkart and mi.com starting February 22. The smartphone will be available offline shortly after. Reliance Jio is offering Rs. 2,200/- instant cashback and 100 percent additional data with Redmi Note 5 Pro as a part of its launch offer. 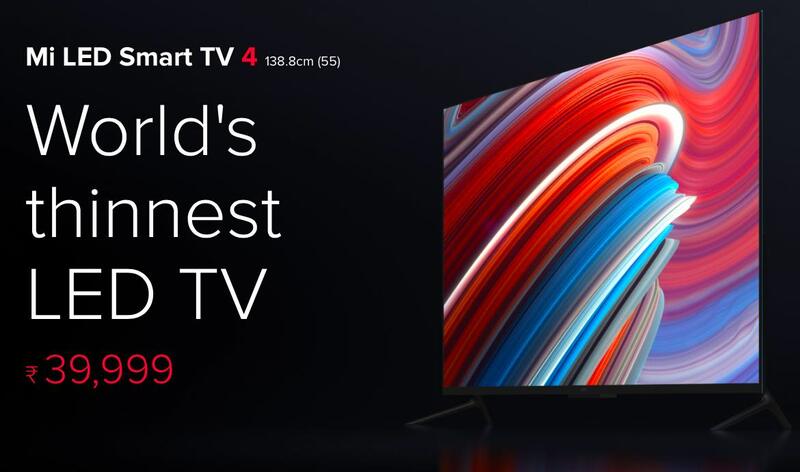 The biggest highlight of the event was the Xiaomi TV, which is the first of its kind the company has brought to India. It is an incredibly thin Smart LED TV which is very aggressively priced. The Mi TV 4 has a 55″ 4K UHD frameless LED display which has a resolution of 3840 x 2160 pixels. The TV is powered by a Cortex A53 quad-core CPU clocked at 1.8GHz paired with Mali T830 image processor. It has 2GB RAM and 8GB storage capacity. The Xiaomi Mi TV 4 features ‘PatchWall’ which offers unlimited content from partner content providers. The technology provides AI-based content recommendations based on your viewing patterns. PatchWall is a customised UI layer on top of Android OS and is enhanced by deep-learning AI technology. The 55″ Mi TV 4 is just 4.9mm thick and claims to be 30 percent thinner than the iPhone 7! The Mi TV 4 sports a frameless design. It comes with an integrated Mi TV Bar which has 10 speakers, 2 wireless rear satellite speakers, and a subwoofer. The TV supports Dolby Atmos audio technology with 2 up-firing speakers to offer a 3D sound experience. Xiaomi has partnered with ALT Balaji, Hungama Play, Voot, Hotstar and more other media houses for providing content. Xiaomi has claimed that almost 80 percent of this content will be free to watch. The 55-inch Mi TV 4 will be available at a price of Rs. 39,999/-. 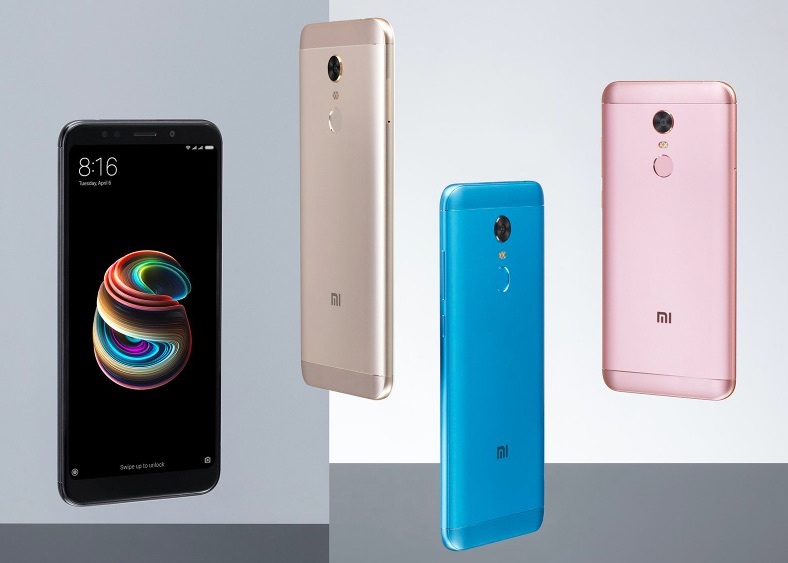 "Redmi Note 5, Note 5 Pro Make Their Global Debut In India; Mi TV 4 Launched! ", 5 out of 5 based on 5 ratings.